In a little reported story, scientists have made a breakthrough in the fight against Ebola — the often fatal “bleeding disease.” Thomas Geisbert of Boston University and a team of researchers have developed an experimental drug that appears to protect monkeys from the most lethal strain of Ebola. With death rates up to 90 percent, Ebola has long been viewed as a prime candidate for a pandemic disease with the ability to wipe out a significant percentage of mankind. The only “positive” aspect of the disease from a pandemic perspective is that it killed people so quickly, the rapid lethality reduced its spread. However, the feel has long been that Ebola could go airborne and pass from human to human. It currently only passes through exposure to contaminated blood (even slight exposure). One case of apparent mutation of Ebola led to an airborne transfer among monkeys in Reston, Virginia in 1989. 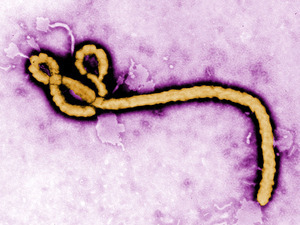 Ebola hemorrhagic fever (EHF) is named after the Ebola River Valley in the Democratic Republic of the Congo and was first recorded as a disease in 1976. Why Does This Man Look Like a Drug Dealer? It should be said that this is a bat virus. It infects monkeys and humans on the side, but with a 90% lethality rate they die much too quickly to be practical hosts for the virus. I’ve read that ebola is causing real damage to the gorilla population – conservationists are very concerned. As BIL says, a truly horrible way to go, so I hope that a human vaccine can be produced soon. Funny, this would have been front page news in the 90s. I guess Ebola is no longer the boogyman it was when we had Outbreak et al freaking people out. I wonder if this was another CIA covert operation gone wrong? This is great news for monkeys. I’d always heard that one of Ebola’s “saving graces” was its rapid spread meant that it burned through infected populaces so quickly that once spotted it was epidemiologically speaking fairly easy to contain an outbreak. Which is good. Hemorrhagic fever would be right near the top of the list of bad ways to go.